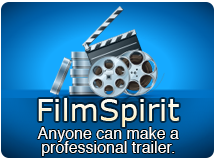 Still bother with playing YouTube or other FLV videos on QuickTime player? Now, 4Media FLV to MOV Converter solves your problem easily as it offers you the fastest and easiest way to convert FLV to MOV video files. If you're looking for the way to watch FLV videos on QuickTime player, then 4Media FLV to MOV Converter will amaze you greatly. This FLV to MOV converter empowers you to convert FLV to MOV video files in batches at high speeds. Not satisfied with the output MOV files? A wide range of output parameters can be adjusted to serve you. You can set the start time and duration to extract your favored segment, choose a split mode to split one file into several ones, change bit rate or use Bitrate Calculator to customize output file size, and even output several MOV files with different parameters at one time to check which one is better. 4Media FLV to MOV Converter is definitely your right choice to enjoy those amazing FLV videos on QuickTime player. Just download it for a free trial now! Quickly convert FLV to MOV video files for playback on QuickTime player. This FLV to MOV converter allows processing each conversion on multi-core. Enable all the cores to get the highest speed possible, or disable some to spare CPU resource for others. 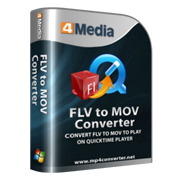 4Media FLV to MOV Converter supports multithreading and batch process, allowing you to process multiple FLV to MOV conversions at the same time. Choose a preset split mode or set your own split time/size before the FLV to MOV conversion, and let this converter split it automatically. The built-in Bitrate Calculator tool in 4Media FLV to MOV Converter computes the video bit rate of the entered size, enabling you to get the file with exact size. Set the start time and duration of the segment you want to extract it automatically when converting to MOV video. There're many other output parameters that can be adjusted: video codec, video size, bit rate, frame rate, audio codec, channels, etc. The profile list is sorted by different types. To make other applications run smoothly, you can set this FLV to MOV converter to run in the background. Several after done actions are provided: quit, shut down, hibernate and standby. Choose one and let the converter perform it automatically after conversion! This FLV to QuickTime MOV converter allows you to preview source FLV video file and take snapshot anytime during preview. The player can switch to be stand-alone with adjustable aspect ratio (4:3 and 16:9). Allow you to manage system power in this FLV to MOV converter. 4Media FLV to MOV converter offers several language interfaces: English, Japanese, German, French and Chinese.